The cleantech sector is one of the most important industries today. Here we take a look back at some of the year’s biggest trends. 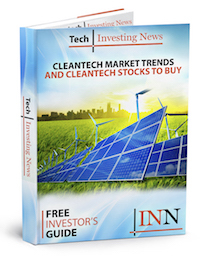 With 2018 coming to a close, the Investing News Network (INN) is taking a look back at the cleantech sector — an industry that was thrown into the spotlight by politicians and one that promises to make waves in 2019 and beyond. In the US, companies have been trying to find ways to offset headwinds from the Trump administration, while in Canada the industry is recovering from setbacks caused by the Ontario government. Read on for a look back at the trends that impacted the cleantech industry in 2018, with commentary from industry experts and companies involved in this space. In late November, the Ontario government unveiled a C$500-million climate plan that promises to lower greenhouse emissions in line with the federal government’s plan, but without imposing a carbon tax. The plan does not clearly detail how emissions will be reduced, but does say the province will be setting up a body called the Ontario Carbon Trust, which will leverage private investment in clean technologies at a ratio of four private dollars to one public dollar. The announcement from Ontario came after a dramatic couple of quarters for the cleantech sector, especially in the province. Premier Doug Ford, who assumed office on June 29, made several moves, including scrapping 750 renewable energy contracts, fighting Canada’s federal carbon tax and ending the cap and trade system. Robert Hornung, president of the Canadian Wind Energy Association (CanWEA), told INN that the scrapping of those contracts has affected the industry’s confidence. “This was not completely unexpected because the government has indicated that it will be looking for cost savings, but the fact that government took that decision to cancel those contracts has had an impact,” he said in a phone interview. Nevertheless, Hornung said that there are projects that are still being built and are going forward, and that the province is home to Canada’s largest wind energy fleet. According to CanWEA, Ontario had 5,076 megawatts (MW) of installed capacity as of August 2018, with 175 MW added in 2018. The firm says that over 2,500 wind turbines generate electricity that contributes 7.5 percent of total electricity demand. Overall, Hornung said that the key trend in the cleantech space is the continued decline of costs. He highlighted SaskPower’s October procurement process for Saskatchewan’s latest utility-scale wind power project, where the average bidding price across 29 proposals was C$3.75 kW/h. Although the price of the winning bid wasn’t revealed, Hornung believes that it would have been at a much lower rate. “It really set a new standard for wind energy cost, showing that wind energy truly is the most cost competitive form of new generation available in Canada,” he said. In 2017, Alberta had a procurement process where the average price was C$3.7 kW/h amongst the four winners, with bids ranging from C$3.1 kW/h to C$4.3 kW/h. Hornung added that the wind energy sector for over a decade has had to deal with criticism that it is not cost competitive, but with the latest developments the space is placed well going ahead. Meanwhile, electric vehicles (EVs) are also part of the Ontario government’s climate change plan. The proposal banks on higher EV sales in helping the government to meet a 2030 target to reduce emissions in transportation sector, although it alone doesn’t reduce overall emissions. Ironically, the Ford government ended incentives for electric and hydrogen vehicles as part of its cost-cutting measures. Across the country, the BC government said in November that the province would mandate that all light-duty cars and trucks be zero-emission vehicles by 2040. The province outlined a three-point plan that includes an increase in the provincial incentive program and the expansion of BC’s direct charger sites. Climate and clean energy body Clean Energy Canada called the BC government’s plan a “win-win” situation in a November statement. Jerry Kroll, CEO of Electra Meccanica (NASDAQ:SOLO), told INN that the BC government’s plan is a “breath of fresh air,” noting that it is an opportunity for the province and the country to do more. Kroll called for “bold initiatives” to be introduced along the lines of the ones given to Tesla (NASDAQ:TSLA) in order to boost the Canadian automotive space. Electra Meccanica, Canada’s only EV manufacturer, noted in October that the company has received over 64,000 vehicle preorders, translating to US$2.4 billion in potential sales. However, Kroll said that the EV market has a challenge on its own. “The most challenging aspect of the EV/cleantech market is to ensure that 100 percent of people understand that EVs are superior in every respect to gasoline-powered cars,” Kroll said in an email. Kroll added that the company’s biggest milestone this past year was the US certification of SOLO, its upcoming car, and its listing on the NASDAQ stock exchange. “Our greatest achievement was that our SOLO became certified for the USA, which is a really big deal and allows us to deliver from our new corporate dealership/showroom in Los Angeles beginning in November,” Kroll said. In November, Canadian Solar (NASDAQ:CSIQ) made its first delivery of its bifacial modules in the US. Bifacial modules generate energy from the front side as well as the back side, leading to a higher returns on investment. The product was delivered to Neighborhood Power, and in a release Neighbourhood Power says that the modules will offset the new tariffs on solar modules and steel mounting equipment as implemented by the Trump administration. In January, the US government imposed 30-percent duties on solar panels, which resulted in several projects being shelved and the industry losing billions of dollars. Meanwhile, the US Energy Information Administration (EIA) revealed that solar, wind and other non-hydropower renewables will generate more than 10 percent of total electricity in 2018. On a comparative scale, the energy from these sources generated less than 10 percent of total electricity in 2017. It should be noted that hydropower is forecast to generate 7 percent of total electricity in 2018, which is similar to what it generated in 2017 and is forecast to generate for 2019. While electricity from renewable energy sources is on an upswing in the US, it still isn’t enough to reduce energy-related carbon dioxide emissions. The report from EIA states that emissions will increase by 2.5 percent from 2017 levels owing to cooler temperatures and higher natural gas consumption. Despite a challenging political landscape in the US and Canada, cleantech companies and the industry as a whole made progress this year. Wind power in particular has grabbed headlines in Canada with its ability to show cost competitiveness, while the EV market is headed for a huge push in 2019 and beyond. Stay tuned for our cleantech outlook for 2019 and what’s in store for the industry.